This before-Santa stretch of time comes with a certain amount of stress and an unfortunate sunshine deficit. Here's how to deal. This past August I created a “November box” of treats to open this month to brighten this endless dull and rainy stretch between early fall and Christmas. 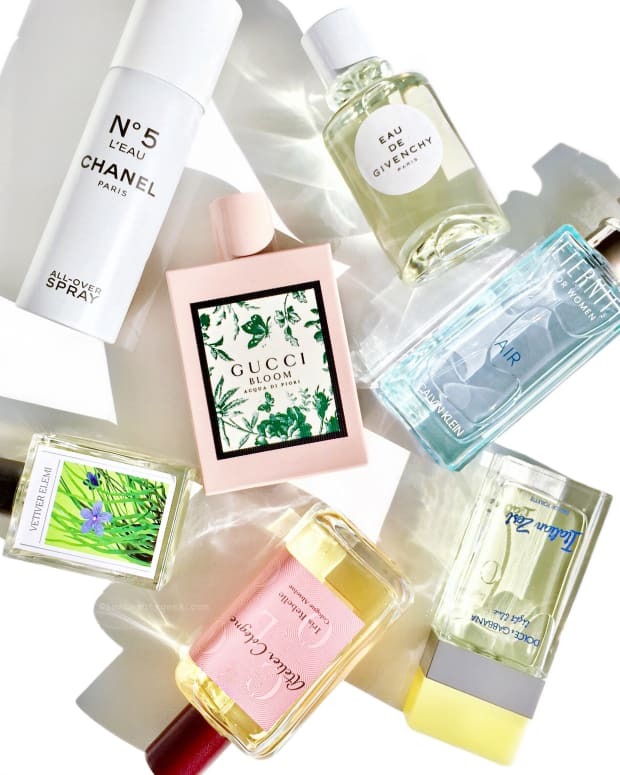 If you did not create a November box for yourself (and next year you really, really should), here are some cheering new fragrance and accessory ideas to help get you through until December 25th. Unless we’re all planning to scale Everest, why do we own so much technical gear? A cuddly Kensie teddy bear coat ($125 CAD and $89.90 USD at nordstrom.com) is warm like a puffer, but much more fun and comfortingly cozy. 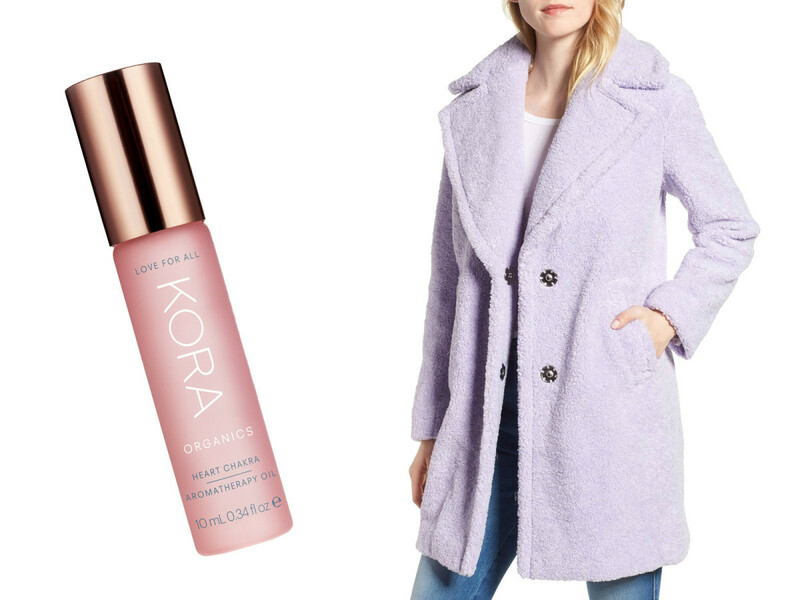 Pair it with the rose-and-sandalwood-rich Kora Organics Heart Chakra Aromatherapy Oil ($48 USD at sephora.com), a blend originally given to Miranda Kerr by her aromatherapist during a “dark time” (her divorce from Orlando Bloom). It’s soothing, protective and calming, even if you aren’t currently separating from B-list movie star. Knee high boots ($280 CAD in black at bananarepublic.com; alternative $159 USD at nordstrom.com) add guts to a floral dress or a classic skirt-and-turtleneck combo like those worn by forever-fashion-idol Carolyn Bessette-Kennedy in the &apos;90s. 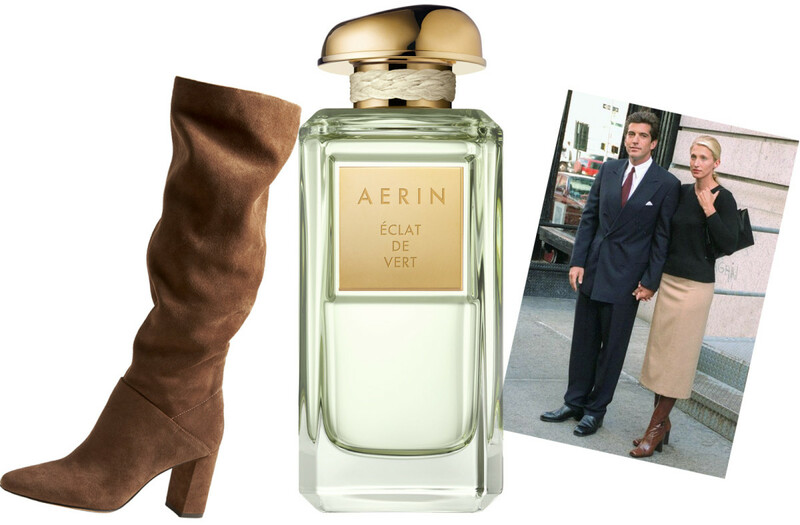 Banana Republic suede boot, Aerin Eclat de Vert, Carolyn Bessette-Kennedy with John Kennedy Jr.
A matching stealthily gutsy fragrance is Aerin Eclat de Vert ($285 at holtrenfrew.com and $225 USD at esteelauder.com), Aerin Lauder’s bottled memory of travelling with grandmother Estée to the south of France. 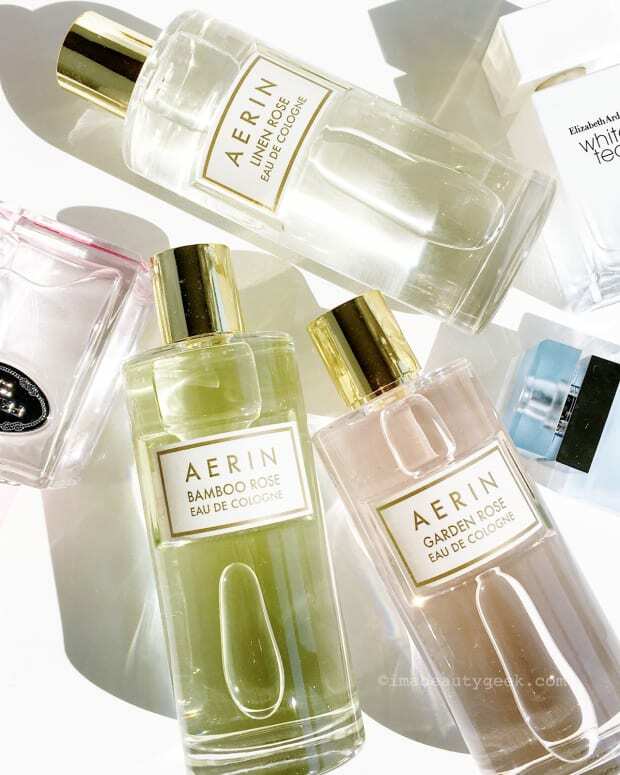 Ostensibly unassuming with citrus, rosa centifolia and jasmine – all totally feminine and unimpeachable – it has an undercurrent of strength from earthy resinous and mossy notes that add an invisible spine to the scent. 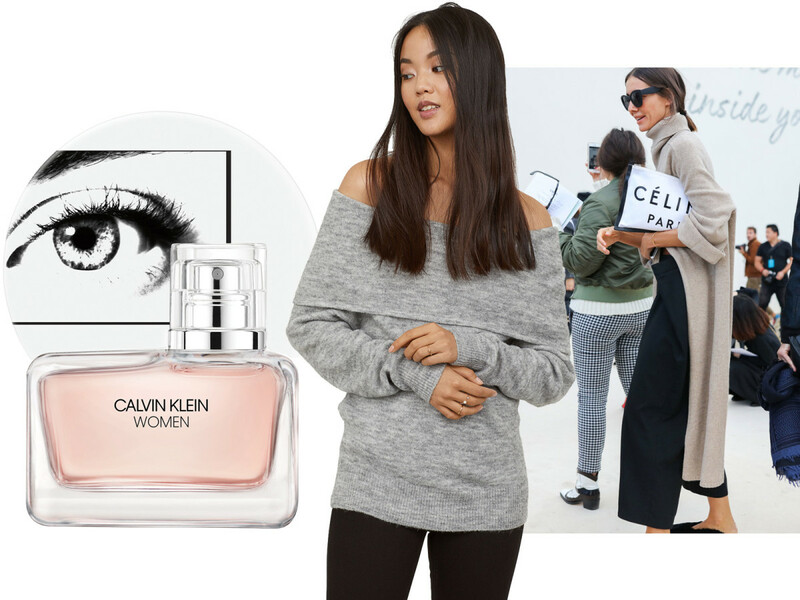 If wearing a peekaboo ab-flashing grey sweater like Ukrainian Vogue’s Julie Pelipas (below right) is a street-style road too far, then cover your midriff and bare your shoulders instead – and wear Women, the new Calvin Klein fragrance (from $92 CAD at thebay.com and $84 USD at nordstrom.com). A celebration of female strength and diversity, it sneakily eschews straight-ahead florals, instead going for a cedar-and-citrus riff. It’s warm and almost unisex – a clean version of a dirty fragrance. 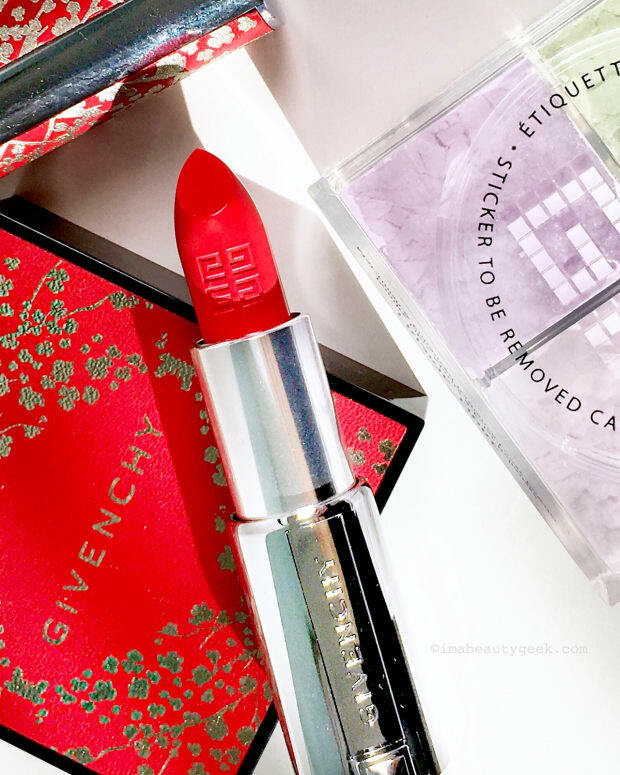 Late Fall’s relentless greyness begs for a shot of colour, but a bright lipstick may not be enough. Canadian mall stalwart Danier is back after a brief absence and, while it’s still the place for well-priced leathers (their lamb leather moto jackets never disappoint), their new, vividly coloured detachable raccoon fur collars ($237 at danier.com), are wardrobe transformers. In bold colours like fuchsia, red and green and blue as well as more sedate natural tones, they can zip onto Danier parka hoods or can be worn alone (as seen here on Courtney Madison (below right), who wears hers with a Diane Von Furstenberg leopard print dress – another big fall trend). A statement piece like this demands an equally un-shy scent. 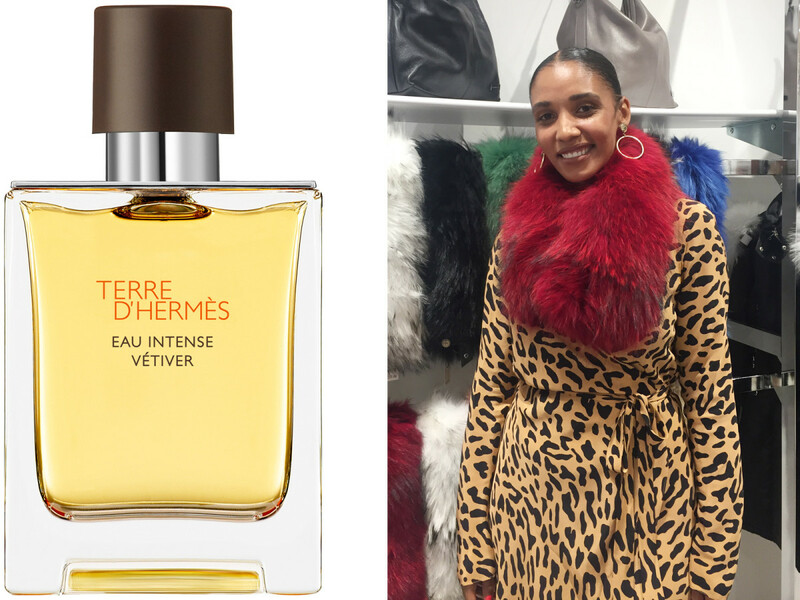 Hermès perfumer Christine Nagel dials up the vetiver in their classic men’s fragrance Terre d’Hermès and adds an almost herbal, citrus hit of bergamot to create Hermès Terre d&apos;Hermès Eau Intense Vetiver eau de parfum (from $100 CAD/$95 USD at saks.com and sephora.com) for a heady, resinous fall–into-winter bottle of awesome. Stealing this one for yourself is a no-brainer. 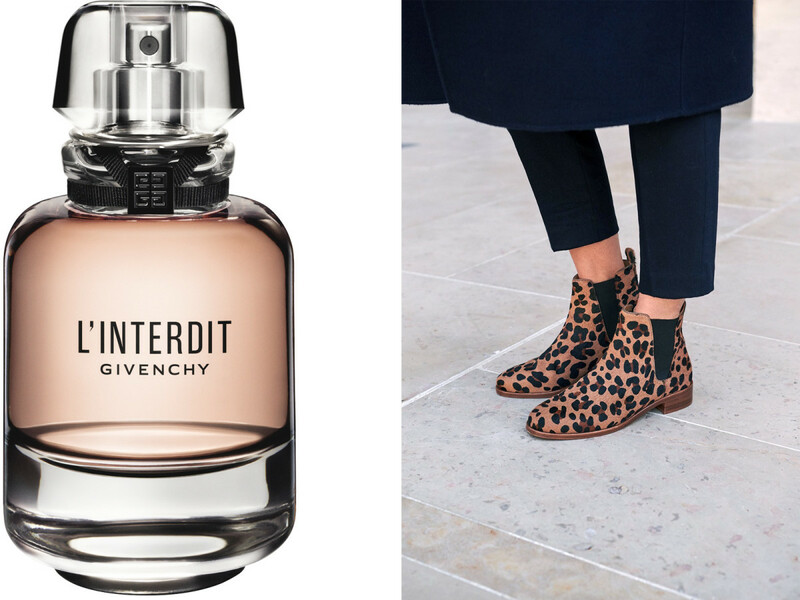 The new L’Interdit (from $80 CAD at sephora.com and $91 USD at bloomingdales.com), as Givenchy reinterprets their old classics, accurately conjures the sensation of wearing a frothy evening dress with its riot of white flowers swirled with candy-ish, almost powdery notes and then the surprise of something darker. It’s super flirty and stealthily powerful. Our friend Fashion magazine Beauty Director Lesa Hannah (above) got these amazing Low Henry Chelsea ankle boots in leopard from Sézane. She has French girl style nailed down. Proof? She can make a buttoned-up collar look chic whereas we look full-on school marm. Not fair. Velvet shoes are so casually extravagant and deeply impractical (any puddle or dirt is their sworn enemy) – they’re made for walking from your front door into a waiting car and heading straight into a party. A pair like these luxurious Le Monde Beryl Venetian slipper shoes ($333 CAD and $295 USD at matchesfashion.com) are best worn slightly devil-may-care with jeans (super-ripped or not), like you’re a member of long-since deposed European royalty slumming it in the new world. 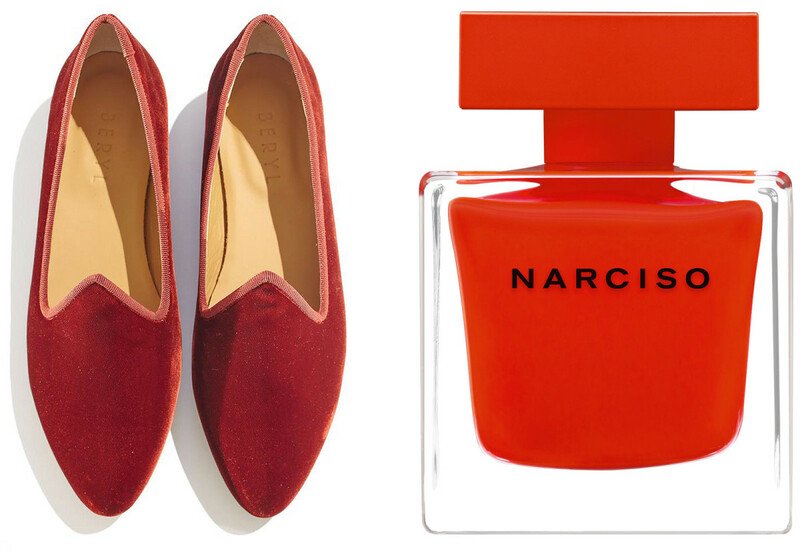 Narciso Rouge eau de parfum (from $112 CAD at thebay.com and $97 USD at bloomingdales.com) has a similarly low-key louche-glam aura that doesn’t shout from the rooftops. It opens with come-hither notes of iris and rose with musk before warming into cedar and vetiver to perfectly conjure smudged eyeliner and artfully dishevelled hair to go with your new fabulous shoes, as you listen to your great-grandmother reminisce about the time she drank with Ernest Hemingway at Harry’s Bar in Venice. If rich and velvety fragrances are not your thing, if pumpkin spice and Autumn in general leave you cold (literally cold, because you’re always freezing after August,) then Fresh Rose Morning eau de parfum and a delicate necklace are the perfect mood elevators you need right now. Mejuri’s gold vermeil and white sapphire zodiac necklace ($101 CAD and $79 USD at mejuri.com) is delicate but not cutesy, girly but not frilly, and ridiculously reasonably priced. Fresh Rose Morning (from $34 at Nordstrom Canada and $25 USD at nordstrom.com) is all dewy bright baby roses with violet leaf and faintly sweet black currants to keep you feeling summery and optimistic while everyone around you grumbles as they clutch tea mugs and complain about it being dark already by 4:30. So, November Box. 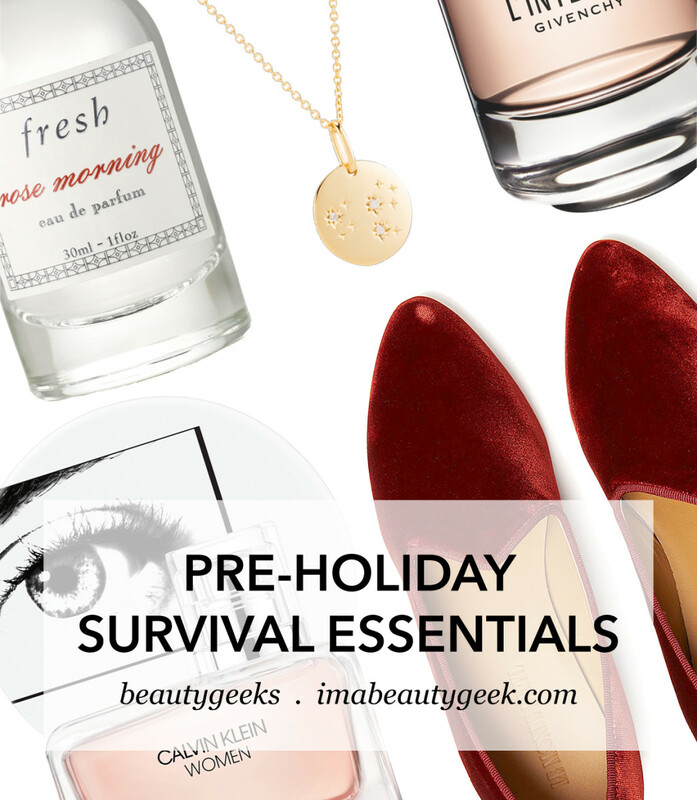 Or pre-Christmas Survival Box. Do you have thoughts? What would you put in yours? Anything here catch your attention?